For a long time, I thought smashed potatoes was just a quirky name people had for mashed potatoes. Because, you know, making mashed potatoes involves smashing potatoes. I’m pretty sure it was actually Janeane Garofalo who explained the difference to me on an episode of Conan O’Brien back in the early 2000’s. Did anyone else see that episode, or am I too old? Anyhow, seeing as how everyone seems to know what smashed potatoes are these days, I’m guessing Janeane set the world straight and you all grew up knowing what smashed potatoes are. But just in case anyone else out there is still in the dark, I’ll explain! Smashed potatoes are smashed considerably less than mashed potatoes. They’re boiled, lightly smashed with a potato masher, and then baked up to a crisp with a little bit of oil. In a way, they’re like a delicious hybrid of mashed potatoes and roasted potatoes. You can season and serve smashed potatoes all kinds of ways. They’re good made with plain old salt and olive oil, but like most things, they’re extra good if you throw some garlic in the mix. I really like mine topped with some creamy aioli, hence the dairy-free basil aioli drizzled over these. Start by boiling some golden potatoes, just until they’re fork tender — don’t overdo it! While the potatoes boil, mix some finely minced garlic and olive oil in a bowl. Once the potatoes are done boiling, drain and transfer them to a lightly oiled baking sheet. Grab a potato masher and lightly mash each potato once or twice. You want them relatively flat and about 1/2 to 1-inch thick. Drizzle your potatoes with your garlic-olive oil mixture. You can used a basting brush to distribute the oil if you like. Sprinkle your potatoes with salt and bake them until they brown and crisp up around the edges. While the potatoes bake, stick some raw, soaked cashews into a food processor bowl, along with a generous amount of fresh basil, lemon juice, garlic, salt and non-dairy milk. Blend everything to a smooth paste. This can take a few minutes! Once the mixture is relatively smooth, thin it with some more non-dairy milk and adjust the seasonings to your liking. Serve your potatoes hot out of the oven with the aioli on the side or drizzled on top. Golden potatoes can vary quite a bit in size. Try to go for small to medium-sized ones when you buy them for this recipe. Larger ones may take a bit longer to boil, while smaller ones will cook quicker. If you’ve got a mixed bag as far as sizes go (like I did), consider removing the smaller potatoes from your boiling water with a slotted spoon as they become fully cooked. Did you forget to soak your cashews? Boil them for 15 minutes instead! Not into aioli, or just don’t feel like making it? Serve your potatoes plain, or try sprinkling them with fresh herbs. Leftover smashed potatoes won’t be quite as crispy as when they first came out of the oven, but they’ll still be delicious. I reheated mine by baking them at 400°F for about 10 minutes. This recipe makes a nice big batch of aioli! I don’t recommend scaling it down unless you’ve got a really small blending device (otherwise, it’ll just end up all over the sides of the bowl and you’ll have a hard time getting it fully blend). Leftover aioli keeps in the fridge for 4-5 days or in the freezer for 3 months. It also makes a great salad dressing if you thin it with non-dairy milk or water. Are these potatoes gluten-free? They sure are! Place the potatoes into a large pot and cover them with a few inches of salted water. Place the pot over high-heat and bring it to a boil. Lower the heat a bit and boil the potatoes until easily pierced with a fork, about 20-25 minutes, depending on their size. While the potatoes boil, stir the oil and garlic together in a small bowl. Preheat the oven to 425°F and lightly oil a baking sheet. When the potatoes are finished boiling, drain them into a colander and let them cool for a few minutes. When the potatoes are cool enough to handle, arrange them on the baking sheet. Gently flatten each potato by pressing on it once or twice with a potato masher. Drizzle each potato with a bit of the garlic-olive oil mixture, and spread the oil around with your spoon or a basting brush. Place the baking sheet into the oven and bake the potatoes until they brown and crisp around the edges, 20-25 minutes. While the potatoes bake, place the cashews, basil, lemon juice, garlic, salt, and 1/4 cup of milk into the bowl of a food processor or blender. Blend until smooth, stopping to scrape down the sides of the bowl as needed. Thin the mixture with the other 1/4 cup of milk, or more if you like your aioli thinner. Taste-test the aioli and adjust any seasonings to your liking. Serve the potatoes immediately after they come out of the oven, with the aioli on the side or drizzled on top. This recipe makes a big batch of aioli. If you have any leftover (you probably will), use it for another batch of potatoes, thin it and use it as a salad dressing, or place it in a sealed container and freeze it for later. 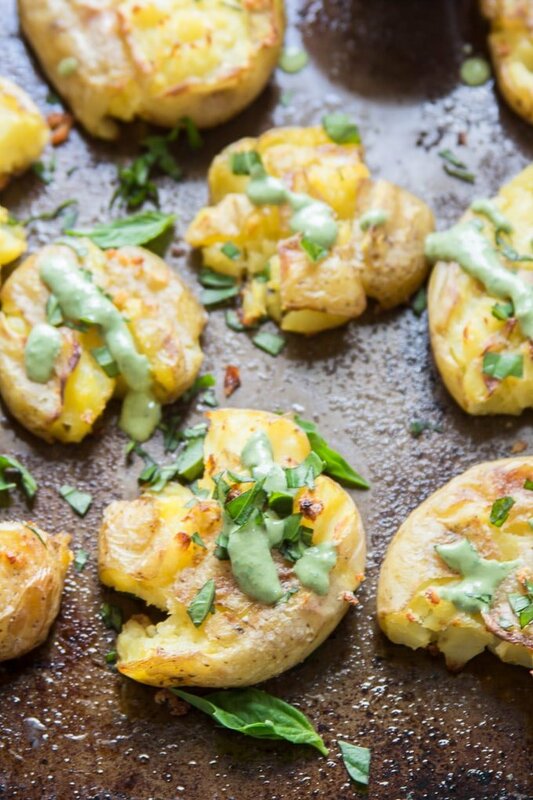 The post Garlic Smashed Potatoes with Basil Aioli appeared first on Connoisseurus Veg.